If you’ve been reading the reviews of Windows 8 on sites like the Verge, Engadget and Gizmodo, you know that there are some dramatic changes compared to Windows 7, or other OSes you may have used. However, taking a little bit of time to understand the Windows 8 start screen will definitely help you to access information that you care about easier than ever before. That’s why all of our new Windows 8 systems include a series of simple video tutorials to help you with Windows 8 basics. We’re shipping the tutorials on all new Windows 8 systems except Alienware machines. When you boot your new system, you will be taken to the Windows 8 Start screen. 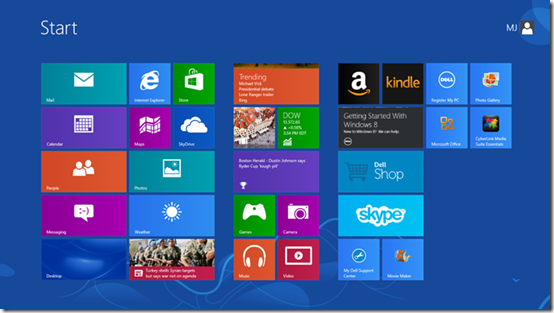 One of the Live Tiles you will see is Getting Started with Windows 8. click on the image below to see a larger version). If you purchase a touch-enabled system like the XPS 12 convertible Ultrabook or the XPS 10 tablet, you will see two sets of videos when you click on the Getting Started with Windows 8 tile: one that covers the basics with touch and another set that explains using the keyboard and mouse. If you purchase a system without touch support, the Getting Started tile will only include the keyboard and mouse specific videos. You can watch all of the videos by clicking through to the Windows 8 Tutorials YouTube playlist. While Windows 8 was built from the ground up to support a touch interface for tablets and PCs, the operating system also works well with a keyboard and mouse. Microsoft supports all kinds of keyboard shortcuts in their new OS. Click on the link to download the Windows 8 keyboard shortcut PDF. I don't expect nothing from Windows 8 because I am not going to use any computer with it on it. It is incredibly ugly interface that is not intuitive and requires huge amount of time to relearn everything. All that what used to take 1 or 2 steps will now require me to excaberate my carpal tunnel by moving the mouse unneccessarily so that they can sell thier tablet. I was going to buy a new computer but since they are preloaded with this new OS I won't buy. @redragon: Understand that Windows 8 is a big change, and the OS interfaces are a subjective thing. One thing I can say is that using Windows 8 in Desktop mode is very similar to running Windows 7 (without the Start button). That said, I understand your point of view and will let you know if there are any developments on the Windows 7 front. I have upgraded to my PC from windows 7 to windows 8 pro without any problem. And it support all the feature except the SECURE BOOT this is due to firmware update & unfortunately dell is not providing any firmware update for windows 8 for XPS L401x. And when i asked dell to please provide firmware update,then they only say that this system does not support windows 8.Therefore no firmware or driver update available for this system. Then I asked the dell customer care to please provide the XP driver. then they only answer that this system only support windows 7 & we have no driver available for this system except windows 7. So if dell will not provide the firmware update to go to the other platform (different from pre-installed) then I think there is huge limitation in Hardware which is used in the dell laptop/desktop. So guise we need to think several time before buying Dell product.